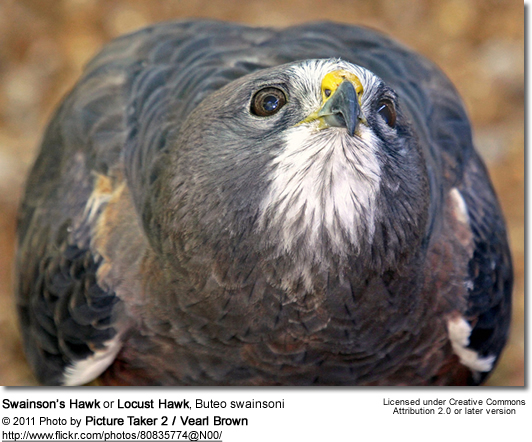 Swainson’s Hawks mainly hunt mice, ground squirrels, rabbits, birds, and reptiles during the breeding season, but they are also commonly referred to as " locust hawk" as they will eat numerous amounts of these insects, as well as grasshoppers and beetles, during the non-breeding season. Unfortunately, with these they also ingest a high amount of toxins resulting in thinning of egg shells, which can over time lead to the extinction of this magnificent bird of prey. Older chicks frequently kill and eat the youngest siblings - which may be related to food availability, but the ultimate cause is unknown.